Even though there is snow still on the ground, spring has officially sprung at University of Wisconsin–Stout. 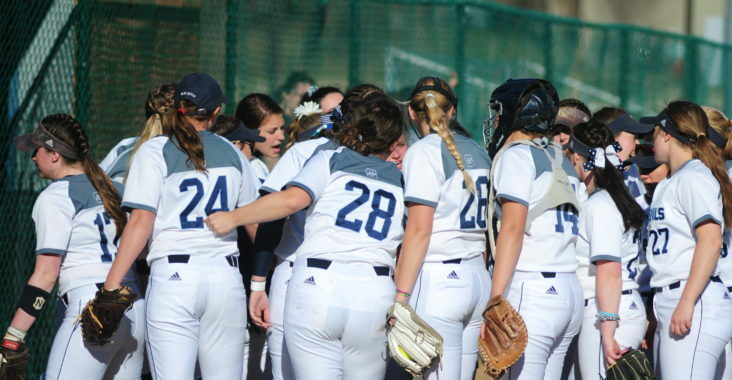 This means spring sports are in full swing, and after an excellent season last year, the UW-Stout softball team looks to continue that success. But season success begins in the offseason and coach Rebecca Iaccino remarks that it all starts with making and setting goals for the season ahead. Preparations that can be tough as the coaches aren’t allowed to work with the players during the offseason, it is left to the captains to set the tone of the off season. “Our team captains each year have done a great job of teaching the newcomers what we do, and what being a Stout softball player means. Skill training, weight training, mental training and team bonding are all being run by our captains. Our culture is being built then. It’s this time of year that’s so key,” said Iaccino. Building the culture is tough, but it’s also very important One such thing that builds team chemistry and culture is not only in the offseason, but it builds in the regular season as well. In the team’s annual trip to Florida that’s exactly what happened. The Blue Devils certainly faced the best on that trip playing against several highly ranked teams within the top 25 and squaring off against a couple ranked within the top 10. On that trip the Blue Devils put up great game after great game, beating teams like Luther University and Tufts University and putting up great fights against St. Thomas and MIT. “I’m so proud of the fight and the building of a champion mindset from that trip. Each opponent taught us lessons on what we do well and what we can improve on, but what the whole trip taught us is if we have HEART, we can be unstoppable,” said Iaccino. The toughest aspect Iaccino says is not being able to practice outdoors. There is some things you just can’t do when practicing inside, but with the team’s motto this season being “What’s your piece,” the team is working together to make the team the strongest they can be.